Looking for Kansas City faves for fairs, festivals, apple picking, and pumpkin patches? 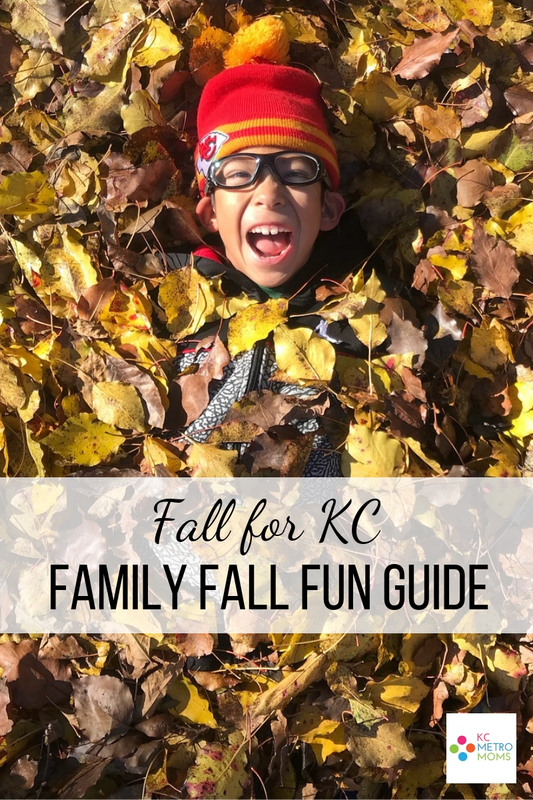 You'll love our new Fall for KC - Family Fall Fun Guide! Get info on all the hot spots in the KC Metro that will have you falling for KC all over again this season! The Great Pumpkin Fest | September 15 - October 28 (weekends): Join us at Worlds of Fun for the ultimate fall festival - The Great Pumpkin Fest! This family-friendly event is all treats and no tricks and features special Halloween-themed activities for kids from 12PM-5PM, plus PEANUTS-themed rides and attractions in Planet Snoopy! Alldredge Orchard | September - October (select weekends): Pick your own apples, choose a pumpkin from the pumpkin patch, and have fun in our play area! Visit the barnyard, where friendly animals are waiting for a treat, or visit the Orchard Cafe for a treat of your own! Be sure to come into the rustic barn store, where all the delights of the fall season await - apples, pumpkins, huge mums, local honey and more - and take a peek at our bees, who work so hard out here. Cider Hill Family Orchard | Open Labor Day - Families come out to the orchard for the day to pick their own apples and enjoy yummy treats like cider donuts, kettle corn, & apple cider slushes. Take a hayride, relax by the fire pit, shop in our quaint cottage store, watch your kids take a train ride, and enjoy the fresh country air. Closed Mondays. Weston Red Barn | Open Labor Day weekend through November: A trip to the Weston Red Barn Farm is like visiting a turn of the century working farm. In the spirit of preserving the American dream of farming, the Red Barn Farm offers visitors the opportunity to experience a real working farmstead. We feature traditional farm animals and crops. In addition to the working farm, we offer school tours, a country store featuring our fresh produce, facilities for weddings and bonfire/hayride events and a fall festival where families can come pick pumpkins and apples, take a hayride and enjoy the country. Liberty Corn Maze | September 7 - October 28: Come celebrate life on the farm at one of KC's largest agricultural entertainment farms. Embark on an unknown journey through our 25 acres of corn maze. This year’s design features all the things that make Kansas City great: fountains, barbecue, jazz, trains and of course the infamous We KC design by Charlie Hustle! Aside from the corn maze, enjoy features like the jumping pad, sunflower maze, yard games, and more! Fun Farm Pumpkin Patch | September 14 - October 31: The Fun Farm Pumpkin Patch is Kansas City’s newest fall adventure destination. We have activities and games for kids of all ages, from the young to the young at heart. Your children can enjoy activities like our tricycle track, pumpkin cannon, barrel train, rubber duck races and more. They can explore playgrounds, enjoy our slides, and bounce to their hearts’ content in our jumbo jumper. Older children and adults may enjoy our corn maze, pumpkin patch, pumpkin slingshot, and hayrides. We are the fall destination. Dunn’s Cider Mill | September - mid-November: Dunn's Cider Mill produces fresh apple cider and cider donuts. It is located two miles south of Kansas City, Missouri and one mile east of the Kansas state line. We offer apple butter (made at the Peters Family Orchard in Waverly, MO), Amish jams, cookbooks, and gift items. Carolyn’s Country Cousins | September 15 - October 31: The farm includes approximately 60 acres planted in pumpkins, corn, and soybeans, plus another 20 acres set aside for pumpkin entertainment and farm fun. New this fall - a carousel! Also featuring a mining camp, petting zoo and pig races! Season passes are available. Raymore Festival in the Park | September 20-22: Enjoy a car show, volleyball, parade, bbq contest, live music, contests, dog show, and crafts. Plaza Art Fair | September 21-23: Fair encompasses nine city blocks and welcomes a crowd of over 250,000. Featuring 240 artists, the Plaza Art Fair is a top-ranked, national art event with three live music stages and 22 featured restaurant booths. It continues to be a weekend of people simply celebrating art and each other, as well as Kansas City’s unofficial welcome to the fall season. Great Grillers Blues and Barbeque State Championship | September 21: Help us crown the food truck king! Choose just one or test them both! Greg-Co Foods and Taste of Kansas City BBQ & Grill will be be going to head to head! Food and non-alcoholic drinks will be available for purchase from each food truck. Save room for a treat because Polar Oasis will be back again this year with icy-sweet treats! Alcoholic drinks will be available for purchase from the Irish American Club of Johnson County Beer Tent. The truck with the highest amount of tips will be crowned our Shawnee Great Grillers Food Truck King! All tips will be donated to the Shawnee Parks & Recreation Scholarship Fund that provides recreational activities and programs for low income Shawnee residents. Be sure to dig deep and tip high for your very favorite truck! While savoring your primo eats, take in the sights, sounds, and smells of the 24th Annual Shawnee Great Grillers. The band will be rockin', the meat will be cookin', and the party will be epic! Wristbands are available for the Kids’ Fun Zone where your little one can jump, jive, and wiggle until their heart is content. 10th Annual Kansas City Juggling Festival and Great Circus Show | September 21-23: Enjoy a weekend full of family-friendly fun including juggling, acrobatics, hula hoop, clowning, yo-yo and much more! As always, the highlight of the Festival is the Great Kansas City Circus Show. In celebration of our tenth anniversary, this year’s show will feature performers who helped found and develop Kansas City’s juggling and circus culture as well as nationally acclaimed talent in juggling, hoop, and aerial arts. KC Zoo Run for Giraffes | September 22: The Kansas City Zoo Run highlights a different featured species each year and the proceeds benefit the Zoo's conservation projects. This year we are Running for the Giraffes! We offer a 4-mile timed event starting at 8:30 am. Our 1-mile Family Fun Run starts at 9:45 am. Both events are open to runners and walkers. All participants receive this year’s featured species t-shirt and finisher’s medal and free race-day entry into the zoo. This run is close to selling out so register now for the 15th annual event. For more information please visit www.kansascityzoorun.org. Schaake’s Pumpkin Patch | September 22 - October 30: Free admission and hayrides! Plus, activities include pick-your-own-pumpkins, hayrides, a hay maze, the straw romp, farm animals for viewing, and a photo area. Concessions available for purchase on-site. Families Blessed Moon Festival | September 22: Decorate lanterns, make crafts, solve lantern riddles, play lawn games, learn about lion dancing & more! HCA FarmK | Family Fun Farm Run | September 22: Grab Your Shoes And Come On Down! The fifth annual FarmK run/walk is coming soon! Funds raised will support the Heritage Christian Academy 2019 and 2020 senior mission trips. This cross-country style 5K race takes place on a farm just west of Gardner, Kansas. The race will take you through crop fields and over rugged terrain. Participants will enjoy the beautiful scenic views of acres of farmland while dodging through a thicket of trees. This is definitely a one-of-a-kind race you won’t want to miss! Wild West Days | September 22: Entertainment from Professor Farquar, the Whip Guy, the Wicked Liars and more! Sample delicious food from the chuckwagons and vote for your favorite (Saturday only) Please park at Olathe North High School 600 E. Prairie Street, Olathe, KS 66061, where a free shuttle brings you to the Heritage Center. Family friendly admission of $5/person ages 5 & up. Print out your buy one get one free admission coupon. Johnson Farms | September 24 - October 31: Offers high quality plants and produce in a beautiful, relaxed setting. Two generations of Johnsons collaborate to run two very different seasons of business – a U-Pick strawberry patch and greenhouse operation in the spring and an apple orchard, U-Pick pumpkin and vegetable patch in the fall. Little kids will love climbing through the Giant Tunnel Maze, PreK maze and Real Firetruck play-yard. Big kids will enjoy our Big Kid Fort Barn. Also enjoy huge jumping pillows included with every kid’s age 3-12 admission. Liberty Fall Festival | September 28-30: As the kids whirl about on the rides to flashing lights and lively music, parents can sample light-as-air cotton candy or cooling snow cones. The festival proves to be a shopper's delight with everything from handmade crafts to home grown fruits & vegetables. The event can be traced back to 1934, with ties to the Clay County 4-H and to William Jewell Colleges' Homecoming events. Many class reunions and get-together's are centered around the festival, which is held on the fourth full weekend of September each year. Lee's Summit Oktoberfest 2018 | September 28-29: Enjoy Kids Street, arts and crafts, German meals, beer and brat tents, the Biergarten, carnival, the Sportzelt, live entertainment, contests, a Rootbiergarten, home brew tasting, German dancers and much more. There’s no cost to attend the festival. Shawnee Oktoberfest | September 28: Crank up the accordions and head on over to Shawnee’s annual Oktoberfest. Hosted by the Shawnee German-American Club, the celebration offers FREE admission for the whole family. This fun and festive event will feature authentic German food and beverages for purchase, along with live music from bands and dance groups. Children will be able to enjoy a variety of games and activities. All in attendance will also have the opportunity to win prizes by buying raffle tickets that benefit a local charity. German or not, this event is wunderbar! Spring Hill Fall Festival | September 28, 29, & 30th: The Spring Hill Fall Festival is for everyone who loves a small town! It's a three day festival starting Friday, September 28th with a talent show! You won't want to miss our Saturday morning Parade! The City Park will be full of fun activities for everyone; live entertainment, craft booths, a quilt show and more! Sunday concludes our festival with a community church service in the park and family fun run. Gieringers Orchards | September 28 - October 28: Wagon ride to our Kansas Agriculture-Interactive Corn Maze & Kids Mini Maze, Access to U-Pick Pumpkins (pumpkins additional cost per pound), Pumpkin Jump, Play Area, Corn Pit, Hay Mountain​​. Admission fee applies. Louisburg CiderFest | September 29-30 and October 6-7: Ciderfest activities begin with the Louisburg Lions Pancake Breakfast from 8:30 a.m. - 11 a.m. Other activities include: Live music beginning at 11 a.m., cider and donut-making, pony rides, and inflatable slide ongoing throughout the day until 6 p.m. Ciderfest also features craft booths, gift & collectible vendors, and multiple BBQ and food vendors. There is no admission or parking fees to attend Ciderfest. Also at Ciderfest, visit our huge pumpkin patch to pick your own pumpkin, experience our 10 acre corn maze, visit with farm animals, play on the hill slide, enjoy the picnic areas and take advantage of the great photo opportunities we've set up. The Corn Maze & Pumpkin Patch area has $10 admission, children 3 and under are free. Family Tree Nursery Nieman Fall Festival | September 29 - 30: Join us for our Annual Fall Festival at our Shawnee location on Saturday, Sept. 29th and Sunday, Sept. 30th for two days of great deals and family fun. Come enjoy music, food trucks, coffee, and tons of kids activities. We'll be ready for fall with a huge selection of pumpkins, gourds, and mums. Also, don't miss out on our Terrarium & Fairy Garden Workshops, too! Overland Park Fall Festival | September 29: The Overland Park Fall Festival features a hometown parade through Downtown Overland Park, the county’s best arts and crafts fair, the state’s best farmers’ market, three stages of concerts, fantastic food and much more! Faulkner’s Ranch Pumpkin Farm | September 29 - October 31: Admission includes over 25 interactive activities for families to play together. Hop on a hayride, visit the friendly barnyard animals, meander through a field maze and more! The Ranch provides plenty of great opportunities for fun Fall photos! Check out the complete list of pumpkin season attractions laid out especially for Fall family fun at our beautiful location. Powell Pumpkin Patch | September 29 - October 31: Enjoy FREE admission to this 35-acre patch, which offers free hayrides, nature trails, hayrides, and a corn maze (additional fee). Concessions for purchase are available on-site. Kerby Farm | September 29 - October 28: The Kerby Farm Pumpkin Patch in Bonner Springs, KS is your destination for family fun near Kansas City this fall! Pick out your own pumpkin! Challenge your mind with our maze! Take your family on a hayride! The possibilities are endless at the Kerby Farm and we have plenty of snacks and drinks to keep you warm or cool, no matter the weather! Gladfest | October 5-7: A Carnival will be open all three days for kids of all ages. Marketplace Tents will be located just west of Community Center and will offer valuable contacts with local businesses and civic organizations. KC Oktoberfest | October 5-6: A two-day celebration of Bavarian heritage modeled after the traditional Munich Oktoberfest in Germany. This festival will feature world-class music and entertainment, delicious menus crafted after the genuine tastes of Bavaria, and family-friendly games and activities inspired by those played in Europe. Louisburg Fall Festival | October 6: Fall Festival kicks off the season by closing downtown streets & filling it with vendors, food trucks, music & entertainment, and more! In conjunction with Louisburg Cider Run...please join us for a wonderful night! Scarecrow Festival | October 6: This family-friendly event includes scarecrow making, pumpkin decorating, Farmers’ Market, baking contest, and seasonal displays. Supplies and decorations will be provided at no cost while they last. Downtown Shawnee will be transformed as businesses and merchants participate in a scarecrow contest. Come and check out all of the creative displays along Johnson Drive and in front of City Hall. For you chefs out there showcase your skills by participating in the baking contest, which includes categories for pumpkin pie, fruit pie, and pumpkin bread. Winners in each category will receive a $50 prize. Samples of the delectable desserts will be available for purchase at the conclusion of the contest. KC Japan Festival | October 6: Experience Japan for a day without leaving the Kansas City metro area! The Japan Festival offers an exciting mix of Japanese popular culture including both contemporary and traditional music performances; martial arts demonstrations; tea ceremonies, Anime and Manga, Kimono exhibits, Samurai workshops, Sumo Suits, Bonsai and Ikebana (the Japanese art of flower arranging) a variety of exhibits, food from local Japanese restaurants, and much more. New to the Festival this year will be performances by Ryoichi Kinoshita, a 7th degree Aikido master from Osaka. Aikido teaches one to flow with natural energy and manage conflict in a way that brings about the restoration of harmony. Kinoshita – sensei is also a master in the art of calligraphy. Also new to the Festival is Yukari Nakano. She is also a top calligraphy master in Japan and a member of the prestigious Japan Art Academy. Festival-goers will have the opportunity to observe the approach of both these masters to the ancient art form. Japanese “J-Pop” singer Aya Uchida will return from Kyoto, Japan to perform with local songwriter and guitarist Jo Yamanaka. Music performances will include the powerful drum sounds of Denver Taiko, and Three Trails Taiko; and, the subtle styling of performers playing Japanese instruments Koto, Shamisen and Shakuhachi. Edible sculpture will be created on-site by Miyuki Sugimori, renowned Japanese Candy Artist, retired from Epcot Center. Festival-goers can visit a Japanese cultural village, learn about creating Japanese garden designs, and shop at a Japanese bazaar where they will find kimonos, other beautiful textiles, and small, handmade works of art. Dyslexia Dash--Fall Fest | October 6: Join Horizon Academy and IDA (International Dyslexia Association--local chapter) for the Annual Fall Fest. We are partnering with IDA this year and will begin the day with a 5K Dyslexia Dash, followed by games, petting zoo, face painting and a pumpkin patch! KC Games for Good | Oct 6, 2018: KC Games for Good is a city-wide event intended to showcase and celebrate - service to our community... and organizations that deliver it. This family-friendly event includes: Exhibit Area showcasing family services. Team Competitions for all. Kids Scavenger Hunt. First Responder displays, music, giant bounce house & more. KC Games for Good is a city-wide event intended to showcase and celebrate -- service to our community. All proceeds from KC Games for Good helps support those in need who are served by local nonprofit organizations. Merriam Drive Live | October 6: Downtown Merriam will transform into a street and lawn party full of music on two stages, food trucks, adult beverages, select crafters, Farmers' Market vendors and more. Live music throughout the day. Meyer Boulevard during Meyer Fest at St. Peter's, featuring family fun for all ages. Enjoy inflatables, rides, games, entertainment, classic carnival games, food trucks, refreshments and much, much more! Children ages 2 and younger: FREE, Children ages 3-18: $15 (access to all rides and games); adults free with a paid kid's admission. All children must be accompanied by an adult. Missouri Town 1855 Fall Festival of Arts, Crafts & Music | October 6-7: Discover why this popular annual fall event has been a family tradition for thousands over 40 years. Skilled interpreters, crafters and artisans will bring this antebellum living history site to life with period music, dance, games, crafts, a fun-filled hay wagon ride, and delicious foods. Pets are not permitted inside the village. Sprint Family Fun Days Fall Festival | October 13: Round ‘em up, partner! Sprint Family Fun Days’ presents our annual Fall Festival! Bring your kids downtown for an afternoon of fall fun including pony rides, a fun run course, pony belly bounce, mechanical bull, “Hippity Hop” horse derby, hay bale maze and more! Stone Lion Puppet Theatre will perform two puppet shows, and kids may trick-or-treat at participating businesses in the Power & Light District. More details to come. Weston Apple Fest | October 6-7: Visitors to Applefest are encouraged to come early on Saturday morning to enjoy Weston’s hometown parade along Main Street at 10:00 am. The Saturday parade will feature antique tractors, classic cars, fire trucks, and bands. There will be over 80 art and craft booths along the downtown Main Street to peruse and you’re also invited to browse the many unique Weston shops during your visit. Our mini-hay baler has demonstrated and sold his hay bales for 26 years. Watch apple butter being made over an open fire and purchase a jar of apple butter to take home. Kids will love to work the apple press to see how apple cider is made. Weston’s famous apple dumplings, apple pies, and cookies will be available through our local churches. You can catch a quick and tasty bite at our Applefest Food Court or, you might choose to sit down, relax and enjoy the delicious cuisine at one of the several fine restaurants in Weston. Fun children’s activities both days are planned in the park with Pony Rides, Face Painting, Straw Bale Maze, Pumpkin Painting, and Agriculture Education Interactive Games and Activities. WaterFire KC | October 6: Experience the sparkling bonfires, live music, and performance art of WaterFire KC at Brush Creek along the Country Club Plaza in Kansas City, Missouri. Free event. FREE Admission Weekend at Overland Park Arboretum | October 6-7: Enjoy free admission all weekend to the beautiful gardens and grounds. Pony Express PumpkinFest | October 12-14: Annual family arts festival held every year during the second full weekend in October. This free family arts festival celebrates the fall harvest with live entertainment, a children’s costume parade, festival rides, games, storytelling, crafts and food. Join us for the lighting of the “Great Pumpkin Mountain” on opening night. Thousands of people come to view hundreds of carved, electrically-lit pumpkins come to life with the flip of a switch! It’s also a great outreach opportunity for showcasing the Pony Express National historic site and the Pony Express riders. Fall Festival at Shawnee Indian Mission | Oct ober 12-14: Enjoy music, local vendors, Living History, crafts, children’s games, food trucks and performances. The festival kicks off with a free Friday night concert on the West building porch from 6-9pm, and goes into full swing on Saturday and Sunday from 10am to 5pm. There is a suggestion donation of $2 per adult to enjoy the festival, and all proceeds go to support the Mission. Summit Art Festival 2018 | October 12 - 14: The Summit Art Festival is a free, outdoor, 3-day, high-quality, juried fine art event in the historic downtown district of Lee's Summit, Missouri. Featuring over 90 local, regional and national artists, visitors will enjoy a unique blend of art and music in addition to the Student Art Pavilion showcasing over 200 works of art created by local middle and high schools students, and the KidsArtZone offering hands-on children's art activities. Entertaining non-amplified music will be provided by several local musicians throughout the entire weekend at various performance locations. Plenty of free parking and unique food and beverage choices offer a fun opportunity for the entire family! Into the Night Fall Festival | October 12: The evening will be filled with fun for the entire family. Activities will include a petting zoo, train rides, nature exhibits at the Prairie Oak Nature Center, crafts and games in the Historic Oxford Schoolyard, fortuneteller, face painter, balloon artist, and storytellers. Make S’mores at the campfire ring near the cabins. Visit with Leawood Police and Firemen. Entertainers will include the Moon Pie Band, Leawood Stage Company’s cast of “Mame”, Mad Science, Vida Dance Company, and children’s headliner Dino O’Dell. The admission fee is just $10.00 per carload at the entry with each person receiving a wristband, which will allow open access to all activities, crafts, games, and entertainment. Food will be available for sale. In the event of rain, all indoor activities will continue as scheduled, as well as any that can move indoors. Halloween Happy Hour at Kansas City Community Gardens | October 12: KCCG’s Halloween Happy Hour will feature a pumpkin carving contest and a spooky movie. Beer and Apple Cider included with ticket purchase, and food truck offerings and a raffle will be available for purchase. Tickets are $5, kids are free. 14th Annual Harvest Festival | October 13: Enjoy an old-fashioned County Fair. Entertainment for all ages: Puppet Show, Historical Games, 19th Century Re-enactors bring the village to life with skits and demonstrations, Music, Face Painting, Kettle Corn, Pony Rides, Pumpkins for sale, and much more! $1 horse-drawn wagon rides from noon to 4:00 p.m. Junior League KC Holiday Mart | October 18-21: Holiday Mart, Kansas City’s only nonprofit shopping event, is the must-attend event of the fall. Proceeds from Holiday Mart support community projects sponsored by the Junior League of Kansas City, Missouri, including programs focused on women and children. Enchanted Forest: Independence | October 19-27 (weekends): A non-scary, family oriented, Halloween event which takes place at George Owens Nature Park. Storybook, fairy tale, and popular movie characters come to life. Lenexa Chili Challenge | October 19-20: About 200 teams compete in our chili, salsa and hot wings contests in hopes of taking home the Grand Champion prize. Teams host private parties on Friday night and give out samples to everyone on Saturday. Activities include musical entertainment both days, fireworks on Friday night, and the Kids Kornbread Contest on Saturday. Glow: The Magic of Nature - A Jack O’ Lantern Festival | October 19-20: Grab your Halloween garb and take a trip out to experience a fantastic fall display at Kansas City’s botanical garden! Begin the night in the Grand Hall, a magical hangout for witches and wizards. View intricately carved JUMBO jack-o-lanterns in our conservatory and vote for your favorite. Stop by the special event tent and enjoy music, cocktails, food trucks and children’s activities and then begin your journey through a mile-long walking path featuring jack-o-lantern displays and spooky surroundings. Garden hayrides are available for an additional charge. Night of the Living Farm | October 19-20 and 26-27: Every October, we transform the Farmstead into a fun-filled, yet eerily spooky place. Our 21st annual Night of the Living Farm takes place after dark with lanterns and jack o'lanterns lighting the way. This event features scary and non-scary activities for all. Kansas City Kids Marathon | October 20: The 2018 Kids Marathon presented by Chick-fil-A benefiting Children’s Mercy returns, giving young runners, Kindergarten through 8th grade, a chance to complete their own mini-marathon on the day of the Kansas City Marathon presented by Garmin. Kids ages 5-13 are able to sign up in groups of 10 or more through their school/youth sports group or can sign up as individuals with a responsible adult accompanying them! October Marketplace | October 20: Spend the afternoon at the Marketplace, where you have the chance to enter a raffle for a handmade quilt and other items from the vendors, visit local crafters and business people, and enjoy a homemade lunch made just for you by the Holy Spirit Ladies Auxiliary! End your day with some baked goods made by the Ladies Auxiliary including pies, breads and cookies. Blue Valley Family Fall Festival | October 20: First 500 kids registered receive a free treat bucket and a pumpkin worthy of decorating. Families welcome! Enjoy carnival games, clowns, face painting, horse-dawn hayrides, kites, inflatables, petting zoo, FREE Belfonte ice cream, and more! Bring non-perishable food items or cleaning products to benefit the Blue Valley Multiservice Center. Boo 'n Brew and Trick or Treat at Town Center Plaza | October 20: Boo 'n Brew and trick-or-treat, too! Trick-or-treat with more than 30 retailers. Enjoy ghost stories, a fire truck, a food truck, and Houlihan's beer garden with a ticketed VIP section you won’t want to miss (yard games, DJ, food, snacks and so much more)! Need we say more? Okay, we will - you can’t miss the chance to see Medusa - World's Largest Snake. She'll be on view during the event with characters from the world famous Beast haunted house. Adult, kid and pet costume contests and a carved pumpkin contest with seriously BIG prizes! We look forward to seeing you and the whole crew for a hauntingly good time! Maple Leaf Festival | October 20-21: The two day festival occurs on the third full weekend of October. A full carnival, a fantastic parade, live country music all day long, train rides, a 5k, and over 300 craft booths fill the two days with family-friendly fun. Sunday concludes the festivities with additional events and crafts for sale and a quilt show. Review our Schedule of Events to see all that's offered. Fall Festival – Pumpkins & Mums | October 20: Crafters, vendors, artists, beer & wine garden, live music, children’s activities and more. Miami County Fall Farm Tour 2018 | October 20-21: This free event is a great time for families and or a date day. There are 14 farms participating this year including Timber View Farm Alpacas, Cozy Acres, Rocking Goat Farms, Terabithia Dairy Goats, Red Barn Quilts, Prothe's Pecans, Star Thrower Farm, Silver Lining Herfeords, Sunflower Orchards, Whispering Elm Farm, and 4 local wineries. Make it a complete day. Interaction with the animals and farm stores or goods for sale at most sights! Food is also available at many of the sights! Enchanted Forest: Lenexa | October 25: Free admission. For one night only, Sar-Ko-Par Trails Park is transformed into The Enchanted Forest, where there is something to delight even the smallest of Halloween revelers. You can enjoy performances by puppets, musicians and singers along the trail around Rose’s Pond and fun photos in the photo booth. Stroll the seasonal displays, visit friendly characters and enjoy performances at your leisure. The Enchanted Forest is primarily an entertainment event - not a trick-or-treating event. However, there will be a limited supply of candy in the sponsor area, thanks to their generosity. Carved Festival | October 25: Celebrate fall with live music and artful pumpkins carved by Kansas City Art Institute students at Carved, a festive family event at the Crestwood Shops from 5 – 8 p.m. on Thursday, October 25. A portion of all the proceeds from shop and restaurant sales throughout the weekend will benefit KCAI student scholarships. For years, KCAI freshman Foundation students have put their carving prowess to work by taking lowly pumpkins and gourds and turning them into intricate art. From frightening to fabulous to funny…these are not your typical jack-o-lanterns! Students will be on site carving and their astonishing pumpkin creations will be available for a $50 donation. Visitors to Carved can get retail therapy at eleven locally-owned shops and enjoy delectable fare at Café Europa and Aixios. The Crestwood Shops, located on 55th Street between Brookside Boulevard and Oak Street, were established in 1922 and is Kansas City’s first neighborhood shopping area. 68 Inside Sports Trick-or-Treat Event | October 26: Dress in costume and trick-or-treat with us! Enjoy food and drinks (6-8 pm), music, inflatables, games, and more! Raffle drawings throughout the night! Grand Star Elementary Trunk-or-Treat | October 26: Free trunk-or-treat event! Hope Lutheran Trunk-or-Treat | October 26: We will have food, games, and trunks to visit. Red Friday at 64th Street Hy-Vee | October 26: Help us get the gameday cheering started at the 64th Street Hy-Vee located at 5330 NE 64th Street, Kansas City, MO this Friday from 11am – 1pm. KC Wolf. Cheerleaders. Former Chiefs player Marc Boerigter. Oh, and we're giving away sets of tickets to the next home game! Everyone is invited! Monster Metcalf 5K Dash and Fall Fest | October 27: We cordially invite you to participate in the 4th annual Monster Metcalf 5K Run/Walk, Kids Monster Dash, and Community Fall Festival with trunk or treat, crafts, games, face paint, balloon art, food and inflatables. This event will raise money and awareness for third world restoration. This is a great community event for the entire family! Kids Halloween Party at Hy-Vee in Lenexa, KS | October 27: Bring the kiddos for our annual Halloween Party. Trick or treat throughout the store, decorate a pumpkin, decorate a cookie, and enjoy our coloring activity. The best part....it's FREE! Trunk or Treat with Overland Park Police | October 27: The Overland Park Police Department COPPS Unit, in partnership with the OP Police Department Officers Foundation and the JCNAACP Branch 4038, is hosting this fun and festive Halloween Trunk or Treat from 3 pm - 5 pm. Fun activities include music, dancing and bite size candy. This is a free community event is in the lower parking lot of the Myron E. Scafe Justice Center. Trunk or Treat & Trucks | October 27: Come in costume for candy, prizes and big trucks! See fire, tow, trash trucks and much more! This event is FREE and open to our community! Holiday Treasures Craft Festival | October 27: Beat the crowds this holiday season and pick up some unique, hand-crafted holiday gifts while you are at it! Admission is free, you have nothing to lose and the perfect holiday gift to gain! Taco Topia | October 27: Experience the biggest Taco Festival in Kansas City! This 1-day food and music festival will feature a variety Mexican eats, while they battle it out for title of "Best Taco". Featuring live music & entertainment this taco inspired event will include local music acts, giant yard games, interactive activities, unique drinks, dancing, and a little more! Historical Hauntings | October 27: The Optimist Club of Shawnee-Mission will be selling snacks at the “Ghoul Café” and there will be trick-or-treating, tractor drawn hayrides, Farmstead tours, an eyeball candy counting contest, opportunities for Halloween photos and costume contests with five separate categories and awesome prizes! Trunk-or-Treat | October 28: Join Central for our annual Trunk-or-Treat! Enjoy boo-tifully decorated trunks, frightfully fun games, and otherworldly snacks. Great for the entire family! Miniature pumpkins will be available for the first 80 kids. Trunk or Treat Fall Fest | October 28: Invite your neighbors and join us at Prairie Creek Elementary from 4 pm - 6 pm for our Trunk or Treat Fall Fest. We'll have inflatables, hot cider, food trucks, photo booth, a drawing for prizes, fun fall activities, and of course, lots of candy! Costumes are encouraged! Olathe West Trunk-or-Treat | October 28: Safe and fun trick or treating for families 4 - 6 pm at Olathe West High School. $1 per child/family max $5. Abdallah Shrine Trunk or Treat | October 28: OPEN TO PUBLIC - ALL CHILDREN WELCOME 7th Annual Abdallah Shrine Units, Clubs & Individuals are Encouraged to Participate 5:30pm to 7:30pm. In the Abdallah Parking Lot. We are now accepting candy donations. Please feel free to drop off bags of candy at the office. We had so many kids last year, that we ran out of candy! Thank you in advance for all donations. Trunk or Treat at Church of the Harvest | October 28: From 5:00 pm to 7:00 pm in our West parking lot. Bring your kids and invite your neighbors for this fun, candy and activity-filled event! There will be free candy, food, hayrides, interactive games, and bounce houses! This event is open to the community so invite your friends and neighbors! We also need your help in making this a great night! Please click THIS LINK to sign up to help us. Malloween at Independence Center | October 31: Grab your pumpkin pales from 5:00-7:00 PM and collect candy, prizes, and coupons from your favorite retailers! Midwest GameFest | Nov 1-4: Midwest GameFest is an annual four-day tabletop hobby game convention held each Fall in the Kansas City area. Come enjoy role-playing games, historical miniatures, board games, card games, organized play, cosplay, workshops, game designers, dealers, benefit events, a used game sale and more! Midwest GameFest is organized and funded by The Role-Players Guild of Kansas City, a nonprofit organization dedicated to promoting the tabletop gaming hobby. 33rd Annual British Faire & Tea | November 3: Join us for our Annual British Faire and Tea Fundraiser. This is your place to get British foods, teas and gifts with plenty of vendors, children's activities and local organizations. Entertainment throughout the day includes music,dancing, a visit from Renaissance Royalty and our new speaker's corner. Tea is served English style at the following times: 11:00 / 12:15 / 1:30 / 2:45. Dia De Los Muertos (Day of the Dead) Festival | November 4: Celebrate the art, music, and culture of Mexico at the annual Día de los Muertos Festival. Add your own special remembrance to our altar featuring traditional elements including butterflies, flowers, and a Catrina figure. Created in collaboration with local artists, area students, and Mattie Rhodes Center. Although every attempt has been made to verify these event details, they are subject to change, as is the case with everything else in the world. Please send any revisions to info@kcmetromoms.com.